Species of Hummingbirds New England Region. This list contains the species of hummingbirds New England. That is, the hummingbirds sighted in the New England states. It is arranged in alphabetical order rather than frequency of sightings. In birding terms, when someone experiences a sighting of a particular bird for the first time it is called spotting "A LIFE BIRD". Some sightings can be very rare and exciting to see. This means that it is a privilege to see a particular bird in this unusual location. Most likely, this will be a one time only sighting. Birdwatchers say, "it’s like winning the lottery". How often, can you expect that kind of excitement? 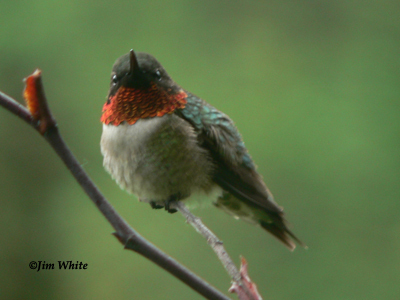 The Ruby-throated hummingbird is the most common in New England. Jim and I are Vermonters. Vermont is famous for it’s sweet treat “Maple Syrup”. It is interesting to note that hummingbirds also love the maple sap from which Maple Syrup is made. Yes, it’s true, hummingbirds eat sap from the Maple tree and other trees such as Aspen. As it turns out, sap from trees is similar to the nectar from flowers because they both contain amino acids and sucrose. One might wonder, how do they access this sap? The tiny beak of a hummingbird hardly seems able to create a hole in the rough bark of trees. Good ole mother nature steps in here with the Yellow-bellied sapsucker, a woodpecker, an expert at boaring into trees to allow the sap to run. The hummingbirds follow the sapsuckers migration to some degree. So they get lots of sap and insects from the trees thanks to the Yellow-bellied sapsuckers. Once the flowers are in bloom, the hummingbirds are all set with the flower nectar. Hummingbirds generally arrive in New England in April and May. To learn more about hummingbird migration and post your own sightings, you can view the Hummingbird Migration Map. It is better suited for your personal use. It is not intended to be used for scientific research of any kind. Of course, we would welcome input from any ornithologist interested in contributing. After all, we enjoy learning all we can about this amazing bird. We would also love to hear from all of our visitors about any hummingbird sightings, rare or otherwise. You can use our "Contact Us" form. NOTE: The Allen's Hummingbird is a rare sighting in Massachusetts. In this year, 2009, an Allen's hummingbird took up residency at a home on Cape Cod. Another interesting fact: Species of Hummingbirds New England; The first documented sighting of a Rufous hummingbird in Vermont was in 1991. Since then there have been intermittent sightings of Rufous males in the June, August and September months.